This is one of those recipes where people are SERIOUSLY impressed. 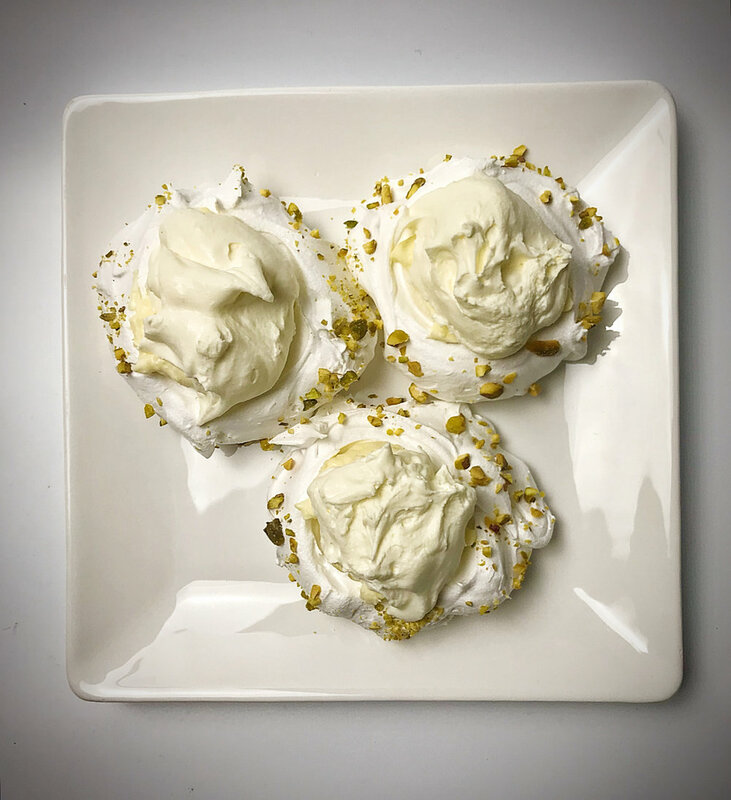 Truth be told- Mini Pavlovas are super easy to do. Possibly more important, the shells can be made a few days in advance- just keep at room temp in an air tight container. You can also play with the size, here I made six BIG Pavlovas- I easily could have split these down to 8-12. In this recipe, I used 3 egg whites. I did this because I also made Pastry Cream which calls for 3 egg yolks. I hate to waste eggs so using both recipes worked out perfectly for me. 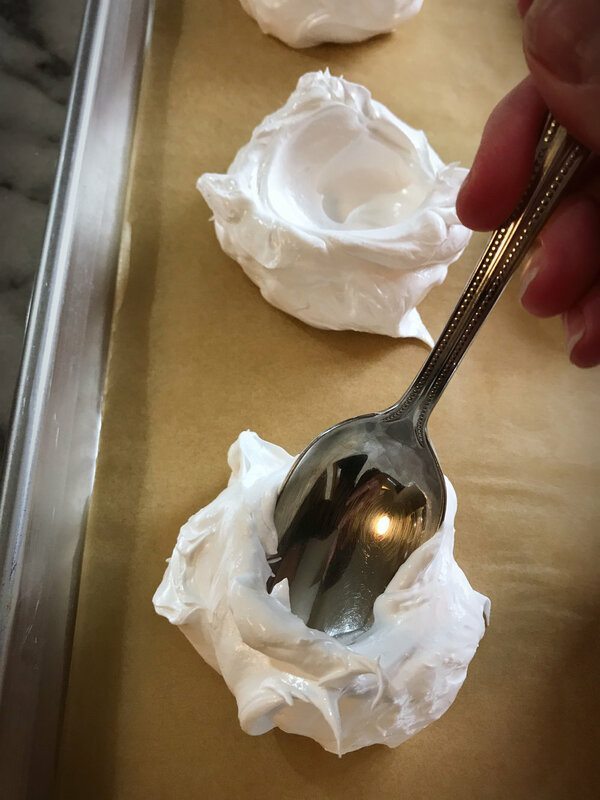 Here’s a trick that not many people know, when making a meringue (which is what the base of a Pavlova is) you can plan on 1/4 cup sugar for every egg white. Meaning, you can take this recipe and make as little as 1 or as many as 8 egg whites at a time. Just plan for 1/4 sugar for each egg white and you’re good to go! While I like to use a pinch or salt and a dash of cream of tartar in my meringues- this is optional. 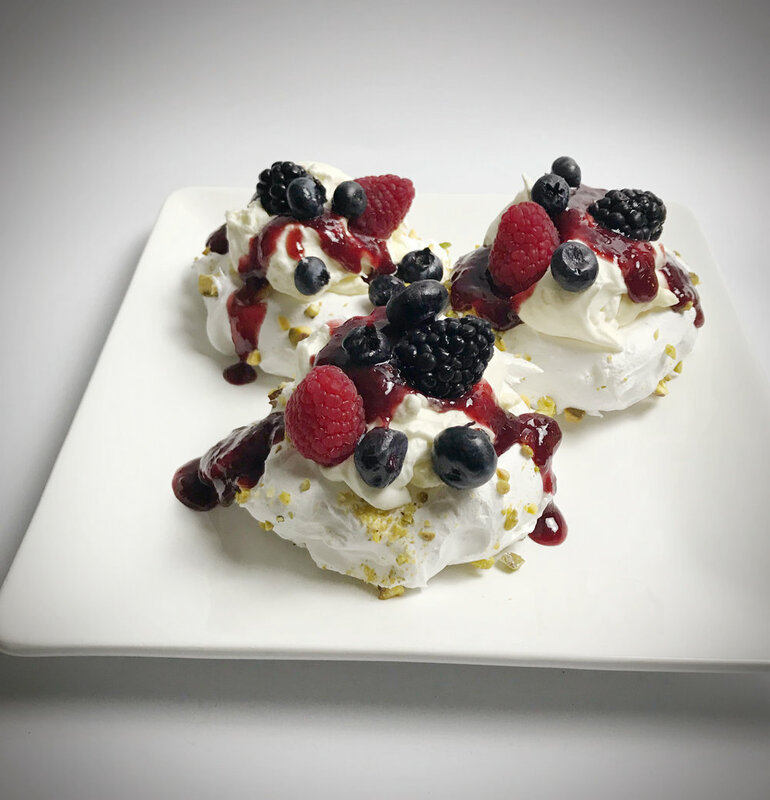 For this Pavlova, I layered Lemon Curd, Pastry Cream, Whipped Cream, Raspberry Sauce, and fresh berries. It sounds fancy- but it really wasn’t so difficult to do. Pastry Cream: I made Pastry Cream, but you can easily use a small box of instant Vanilla Pudding. I only suggest that you use the PIE instructions. If using instant pudding, I always suggest you split the milk with half milk, half heavy cream. Meaning, if the recipe calls for 1 1/2 cups Milk- use 3/4 c milk and 3/4 c heavy cream. This will give you a nice, thick consistency- and it’ll be ready in 10 minutes! Lemon Curd: If I don’t have the time to make a homemade curd (like this Blood Orange Curd), just pop into Trader Joe’s and buy their Lemon Curd. It’s affordable, tangy, and sweet! Whipped Cream: Homemade whipped cream is quick and simple. If you don’t have the time or inclination to do so, just buy a can of Whipped cream or a small tub of cool whip. No biggie. Raspberry Sauce: This may sound fancy but all I did was take 5 tablespoons of seedless Raspberry Jam + 1 tablespoon of water and heat it up in the microwave for about 30 seconds. This is all you need for a quick raspberry sauce. I used one tablespoon for each mini pavlova. Fresh Berries: Here I used Blackberries, Blueberries, and Raspberries. It’s what i had at home so it’s what I used. You can pick one berry or a few- it’s up to you! 2. In a stand mixer, whisk egg whites, salt, and cream of tartar on medium speed until foamy. Turn up speed to medium/ high and slowly add sugar. Whip until glossy, stiff peaks form. TIP: your bowl and whisk must be CLEAN. Any trace of fat or egg yolk will result in a failed meringue. Take the steps to insure your bowl and whisk are clean and dry! 3. Line a baking sheet (or two depending on desired size), with parchment paper. 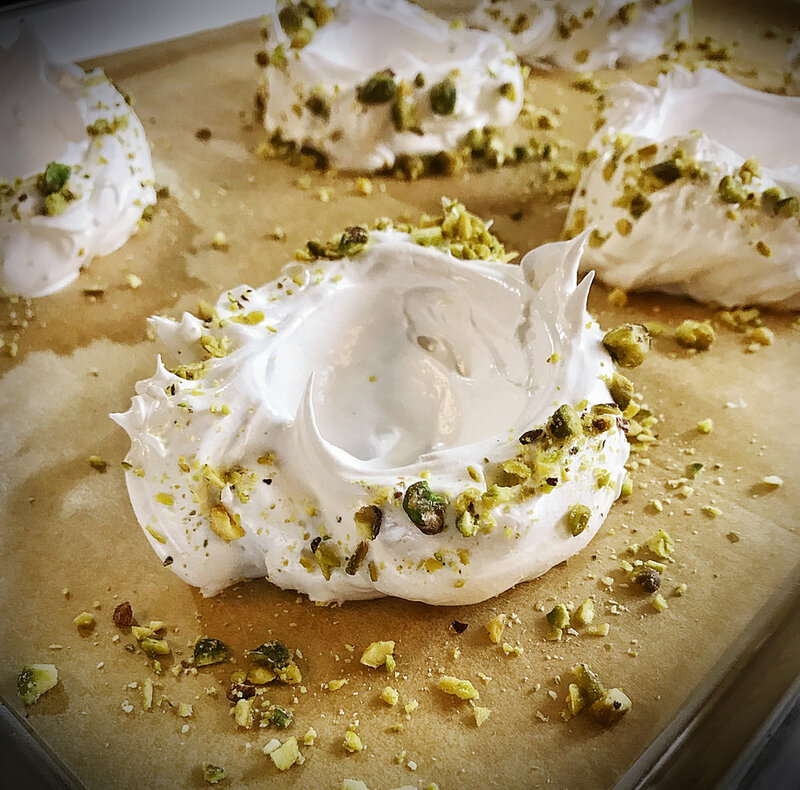 Evenly dollop the meringue onto the parchment. With a spoon, create a well in the center of each by keeping the tip of the spoon down and at a 45 degree angle moving in a slow clockwise direction. ** if adding chopped pistachios, sprinkle them on now. 4. Bake for 2 hours. Remove from oven and let cool completely at room temperature. 5. Once cooled completely, gently peel off parchment. If making ahead, place in an airtight container up to three days before serving. 6. Layer in your filling. Here I layered Curd, Pastry Cream, whipped cream, raspberry sauce and finally topeed with fresh berries. TIP: Fill just before serving! The pavlova will be soggy and crumbly if filled too early. Leave your comments. I am interested to know how it turned out!!! Bananas Foster: Fill with Pastry Cream or Vanilla Pudding, sliced bananas and with Whip Cream. Take 4 tablespoons of salted caramel (Trader Joes has a good one) and add 2 tablespoons of bourbon or dark rum. Mix the caramel well and warm up in the microwave for about 30 seconds before drizzling over the top of the pavlovas. Can you say AWESOME???? I could go on and on but you get the idea! take some of your favorite flavors and try something new! I love to hear your feedback. If you tried this, let me know how it tuned out!